Concerted efforts to enforce global intellectual property rights (IPR) continue to focus intensely on the developing countries of East Asia, and China in particular. These efforts have spawned a complex system of legal mechanisms that is still very much in process of evolution, encompassing international and regional conventions, WTO dispute settlements, bilateral and plurilateral treaties, decisions of national courts and regulatory bodies, and a welter of local laws and border controls. This hugely useful book provides more detail than will be found in any other source on the current state of all these measures and their interactions and trends, especially as they affect East Asian markets for IPR-protected products. impact of broad enforcement provisions on innovation and emerging creative industries. Although wide-reaching in its overall presentation, the book also deals with numerous particular applications in Cambodia, Indonesia, Brunei, Laos, Myanmar, Malaysia, The Philippines, Singapore, Thailand, Vietnam, Australia, China, and Japan. Lawyers seeking a secure foothold from which to proceed in cases of piracy, infringement, or counterfeiting will welcome this informative and up-to-date analysis and commentary. It will prove especially valuable as an early indicator of changes likely to come about as ACTA takes effect. Chapter 1. Introduction; C. Antons. Part I. The WTO-TRIPS Provisions on Enforcement, TRIPS-Plus and ACTA. Chapter 2. Proposals for International Criminal Enforcement of Intellectual Property Rights; M. Blakeney. Chapter 3. The Framework for IP Rights Enforcement in the EU; T. Jaeger. Chapter 4. IP under the Proceeds of Crime Act 2002 (UK); L. Blakeney . Chapter 5. Legislative Reform Related to Intellectual Property Enforcement in Japan; N. Ono. Chapter 6. Initiatives on IP Enforcement beyond TRIPS: The Anti-Counterfeiting Trade Agreement and the International Medical Products Anti-Counterfeiting Task Force; C. Antons, G. Garcia. Part II. Copyright Enforcement in a Digital Environment. Chapter 7. Through the Lens of the TRIPS Enforcement Text and WIPO “Internet” Treaties: The Possible Shift to a Creative Economy in Southeast Asia; M. Schlesinger. Chapter 8. The Criminalization of Copyright Law; S. Gething, B. Fitzgerald. Chapter 9. The Tangled Web of Copyright Enforcement on the Web in Singapore; Yee Fen Lim. Part III. Intellectual Property Enforcement in China. Chapter 10. The US-China Dispute over TRIPS Enforcement; P. K. Yu . Chapter 11. IP Law Enforcement in China – Think Outside the Box; Jianfu Chen. Part IV. Intellectual Property Enforcement in ASEAN Countries. Chapter 12. Intellectual Property Enforcement in Vietnam: Recent Legal Reforms; Phan Viet Dung..
Chapter 13 . 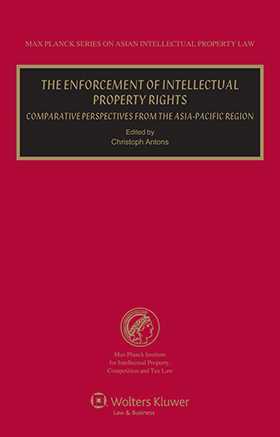 Intellectual Property Enforcement under TRIPS: The Philippine Experience; F. Negre. Chapter 14. The Intellectual Property Jurisdiction of the Indonesian Commercial Court; C. Antons.